Subscribe to the W.Va. Explorer newsletter to receive timely tips on where to stay and where to play in West Virginia as well as updates on new West Virginia Explorer features and events and insights into West Virginia with publisher David Sibray. 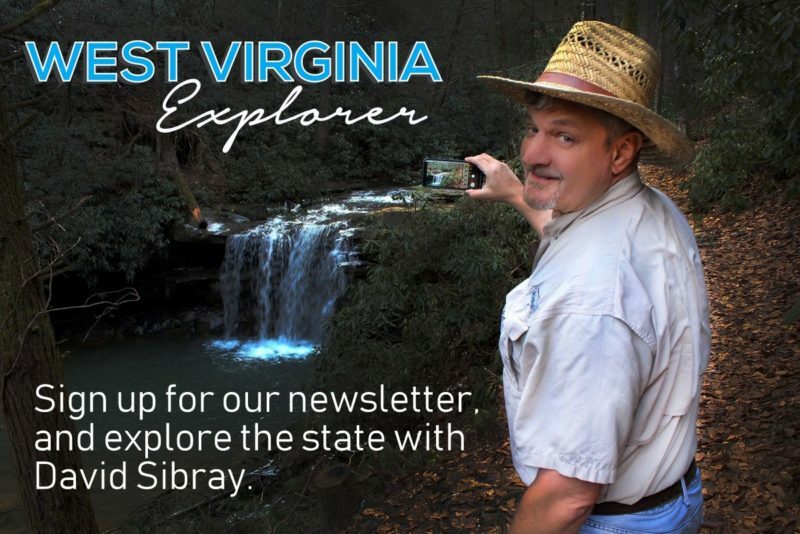 Sign up for the West Virginia Explorer Newsletter, and explore the state with David Sibray! All newsletter subscribers may opt to register to win drawings to receive discounts and travel packages! You’ll also be informed about special West Virginia Explorer events and merchandise. Would you like to be entered into our sweepstakes? Yes, I agree to the Contest Rules. Please enter me into the Sweepstakes. No, I just want to receive the Newsletter. NOTE: We value and respect your privacy: your email address will NOT be shared with a third party nor will it be sold or used for purposes other than subscription to our newsletter. You can unsubscribe from our newsletter at any time. 1. All winners must be at least eighteen years of age. Only one entry per individual, per drawing. (a) Employees of company, and its directors, affiliated non-profit directors, general sponsors, promotional partners, contractors, or any other publications licensed by the company; and members of their immediate households are ineligible to participate or win. 1. All prizes MUST be verified at the office of West Virginia Explorer located at 115 White Ave., Charleston, W.Va.
2. In the event that the prize won is valued at more than $600, the winner will be responsible to report and pay taxes on the amount won. 1. Payment of all federal, state, and local taxes is the sole responsibility of the winner. Winners may be required to sign an IRS form or the equivalent. 2. All drawing winners may be required to sign a liability release. Pursuant to the liability release, the winners will agree to hold company, and its officers, shareholders, directors, employees, agents and representatives, as well as its subsidiaries, affiliates, general sponsors, promotional partners, harmless against any and all claims or liability, directly or indirectly related to or arising from the drawing winner’s participation in the drawing. 3. So long as no participant is adversely affected in any material way, the company reserves the right to make changes to the rules of the drawing. Any changes made will become effective as deemed appropriate by the company. 4. No purchase is necessary. The drawing is void where prohibited. This drawing is subject to all applicable federal, state and local laws and regulations. 5. Company, participating sponsors and their respective parent companies, subsidiaries, affiliates or their representatives, agents and employees are not responsible for the inability of any participant to complete or continue a telephone call or internet entry due to service outages or interruptions, delays, busy signals, equipment malfunctions, inadvertent disconnection or any other technical difficulty. 6. Failure of a participant to comply with the drawing rules may result in a participant disqualification. 7. Company, its subsidiaries, its participating sponsors and promotional partners will not assume any responsibility for any changes in the execution of the drawing, including: cancelation of the drawing as a result of the occurrence of events not within the control of company, its subsidiaries, participating sponsors/promotional partners and other radio stations, such as Acts of God, Strikes and Terrorists Acts. 8. Winners must claim prizes within 30 days. 9. Contest rules remain posted on-line indefinitely.